Billionaire conservative icon David Koch is stepping down from the Koch brothers� network of business and political activities. The 78-year-old New York resident is suffering from deteriorating health.... David Koch is leaving his roles as executive vice president and board member for Koch Industries and a subsidiary, Koch Chemical Technology group, where he served as chairman and chief executive officer. Koch is also stepping down as chairman of the board for the Americans For Prosperity Foundation, the charity related to Koch brothers� primary political organization. ....we do not expect shareholders to monitor the fairness of corporate employment practices. We deny government support, for instance, to companies that discriminate by race or gender in hiring. In the United States, such companies cannot gain government contracts. Tax dollars, Americans have come to believe, should not subsidize enterprises that increase racial or gender inequality. Stakeholder-oriented corporate reformers are extending this analogy to executive compensation. Tax dollars, they maintain, should also not subsidize enterprises that widen economic inequality. ....In the United States, private-sector firms currently take in about $500 billion every year in federal government contracts, for everything from manufacturing military aircraft to serving food and drinks in national parks. Over a fifth of the US workforce, 22 percent, labors for a company that holds one or more federal contracts. Millions of other Americans work for firms with state and local government contracts. ....Imagine if all this taxpayer largesse came with strings that tied top executive compensation to worker pay: no contracts, no subsidies, no tax breaks for corporations that pay their top executives�in salary, bonus, and incentives�over 25 or 50 or 100 times what their workers are making. ...the market cap of JPMorgan Chase versus Ford. JPMorgan Chase doesn�t manufacture anything other than financial products � for which there is essentially no barriers to entry. That is, hundreds of other investment banks, brokerage firms, insurance companies and mutual funds around the globe are doing the same thing. But somehow, JPMorgan Chase has achieved a market cap of $375.75 billion while Ford, which makes the automobiles that get us to and from work each day, has a market cap of a measly $47.70 billion. Even if you threw in General Motors, which has a market cap of $61.82 billion, you�re still looking at less than a third of JPMorgan Chase�s market value. And here�s another weird anomaly. JPMorgan Chase�s stock price seems to defy not only gravity but mind-blowing reputational damage. The bank has pleaded guilty to three felony counts since 2014 and put on probation by the U.S. Justice Department and yet its stock has set multiple new highs this year. It should be noted that from peak to trough during the dot.com bust, JPMorgan Chase lost more than 70 percent of its value. The whistleblowers of the 2007-2008 financial crashes have been crushed and need help. [The Steady Enmity of Powerful People, by Golem XIV on June 4, 2018, via Naked Capitalism]. A book has been written about the idealistic and brave whistleblowers of the 2007-2008 financial crashes. There is no happy ending. All of the stories involved the whistleblower following the law and reporting their concerns. In every story the result was being threatened with punitive, some might say vindictive, legal action by the very banks whose wrong doing they had reported. In every case the �Proper Authorities�, in charge of regulating the banks, hung the whistleblowers out to dry. All the whistleblowers were blackballed from their profession and lost their livelihoods. The majority lost their homes. Another disturbing common thread was that many of the whistleblowers, who had been well paid, and respected employees of the banks, found that as soon as they went public with their complaint, they were accused, by the banks, of being mentally unstable and in need of detention in a mental facility. Many lost their family as a result. In every case the leading politicians of all the major parties in the whistleblowers� country, ignored the whistleblower and closed ranks with the banks and the regulators. Very often they too would join the banks in solemnly suggesting the Whistleblower had had some sort of tragic mental breakdown and was now unstable or delusional. But the most depressing thing about the book is that it was never published. The writer is friends with a whistleblower who has reached his or her limit and is appealing for aid. Go to the link if you can help. Wall Street CEO to Worker Pay Ratios Don�t Capture What�s Going On, by Pam Martens and Russ Martens: June 5, 2018 [Wall Street on Parade]. ....located an hour north of Vancouver, British Columbia, is the brainchild of a company called Carbon Engineering. One of the founders of Carbon Engineering is Harvard�s David Keith, a researcher studying this and other conceivable methods of �geoengineering� our planet�s climate. This week, the Carbon Engineering team has published a nuts-and-bolts breakdown of its design, providing the first cost analysis of a working carbon capture plant. ....Wind and solar are variable renewable energy sources that drive down electricity prices as their volume increases, potentially changing the landscape of the US electrical grid, write Joachim Seel, Andrew Mills and Ryan Wiser of the Lawrence Berkeley National Laboratory. They share how utilities can shift demand to take advantage of high VRE levels, for example encouraging the use of at-home electric vehicle charges in regions where wind production is higher at night. ....How do solar and wind influence energy prices? And since power plants last for decades, what should policymakers and investors think about to ensure that investments in power infrastructure pay off in the future? The Sierra Club is expected to release "Reinventing Power: America's Renewable Energy Boom," this summer, depicting the growth of renewables in the US and how the industry has revitalized the lives of many Americans and the communities they live in, Eillie Anzilotti writes. "We're telling the story of the clean energy revolution through the voices of the people who are benefiting from it," adds Mary Ann Hitt, director of the Beyond Coal campaign at the Sierra Club. California faces new problem of too much solar and wind forcing down electricity prices [MIT Technology Review]. The article provides the technical details, but utterly fails to raise the really important issue here: This is another example of how "markets" are often not capable of meeting society's needs and goals without the active intervention of governments. In April, California solar and wind farms shut down or dialed back nearly 95,000 megawatt-hours of electricity, a new record, according to the California Independent System Operator, which manages the vast majority of the state�s electricity. That�s enough to power more than 30 million homes for an hour.... cost and price are not the same. In a normally functioning market, prices that regularly drop to zero will eat deeply into the profits of power plant operators, strongly discouraging companies from bringing more facilities online. In California, utilities will spend $768 million on electric car infrastructure, by Megan Geuss - 6/2/2018 [Ars Technica]. Pacific Gas & Electric (PG&E), will spend more than $22 million on installing 230 direct current fast-charging stations in the state. San Diego Gas & Electric (SDG&E), and Southern California Edison (SCE) together will spend $236.3 million and $342.6 million, respectively, "on infrastructure and rebates to support electric trucks, buses, and other medium or heavy-duty vehicles," including 1,500 charging stations for those vehicles. ....is a twin-turboprop Beechcraft King Air 90, equipped with a pair of sensors pointing through a glass cutout on the bottom of the plane. The lidar measures the volume of the mountain snowpack while a spectrometer gauges its reflectivity, together providing a highly accurate estimate of how much water will run off the mountain in the spring and when it will flow through California�s warren of dams, reservoirs, and aqueducts.Californians have been trying to accurately measure the Sierra snowpack for more than a century. Every winter, the California Department of Water Resources dispatches surveyors on cross-country skis and snowshoes to hundreds of designated spots, where they plunge aluminum measuring tubes deep into the snow. That data is supplemented by more than one hundred remote sensor stations situated throughout the range, where �snow pillows� provide estimates based on the shifting weight of snow above them. But these snapshots often don�t add up to an accurate picture of these sprawling high-mountain watersheds. In some years, the estimated amount of water that eventually reaches reservoirs like the Hetch Hetchy system, which serves nearly three million customers around San Francisco, can be off as much as 40 percent. That�s a plus or minus of tens of billions of gallons of water. The Fighting Has Begun Over Who Owns Land Drowned by Climate Change. America�s coastal cities and local governments are already engaged in legal battles over real estate that is disappearing underwater as sea levels rise. "Coastal erosion and rising seas are submerging a football field�s worth of Louisiana land every hour..." [Bloomberg, via Barry Ritholtz's The Big Picture]. More proof Republican tax cuts do not work: Fodder for the Bulls: �America Inc. Has a Record $2.5 Trillion Gift for Stock Investors� [Bloomberg 6-5-18]. �Between buybacks, dividends, and merger activities, companies are poised to plow $2.5 trillion into the stock market this year, according to UBS Group AG. The buying spree is equivalent to 10 percent of the S and P 500�s market capitalization, easily outstripping prior records. Union Pacific sets $20B stock buyback [Rail News]. That is six times more than the Omaha-based railroad's planned capital expenditures of $3.3 billion in 2018. DARPA considering bids for new constellations of LEO military satellites [SpaceNews, by Sandra Erwin � May 31, 2018]. The Defense Advance Research Projects Agency--which historically has been a first funder of new technologies because military keynesianism is tolerated in USA by conservatives, libertarians, and neoliberals--has begun to study the bids it has received for its Blackjack program. The goal of Blackjack is to replace large, very expensive and very vulnerable military satellites placed in geostationary orbits, with to a low Earth orbit constellation of smaller, cheaper, more easily replaced satellites. Of note: DARPA intends to keep Blackjack unclassified, in hopes of attracting bidders who do not have security clearances. Spearheading the Blackjack program is Fred Kennedy, director of DARPA�s Tactical Technology Office. Kennedy has criticized the military space business as being stuck in its old ways and missing opportunities to jump on the innovation bandwagon. At industry conferences, Kennedy has called out the Pentagon for embracing a culture of high performance and low risk that is now working against the military because it has given enemies ample time to develop counter-space weapons that could be used to disable or destroy U.S. satellites. New chief of Russian space agency Roscosmos Dmitry Rogozin poses big problem for NASA [Space News, by Matthew Bodner, June 6, 2018]. Russian President Vladimir Putin has delivered a warning to the West with the appointment of former deputy prime minister Dmitry Rogozin as head of Roscosmos. Rogozin is one of the Russian officials placed on the 2014 USA sanctions list in the USA response to Russian actions and influence in Ukraine and Crimea. Independent defense and space contractor Orbital ATK to be acquired by Northrop Grumman [SpaceNews, by Sandra Erwin � June 5, 2018]. The U.S. Federal Trade Commission has approved Northrop Grumman's $7.8 billion purchase of Orbital, allowing the monopolization of the aerospace industry to continue. Three large conglomerates have dominated USA aerospace industry for the past decade. Source: The American Aircraft Industrial Base: On the Brink, by David R King, January 2006. In this study, "Experimental Evidence for Tipping Points in Social Convention," co-authored by Joshua Becker, Ph.D., Devon Brackbill, Ph.D., and Andrea Baronchelli, Ph.D., 10 groups of 20 participants each were given a financial incentive to agree on a linguistic norm. Once a norm had been established, a group of confederates�a coalition of activists that varied in size�then pushed for a change to the norm. 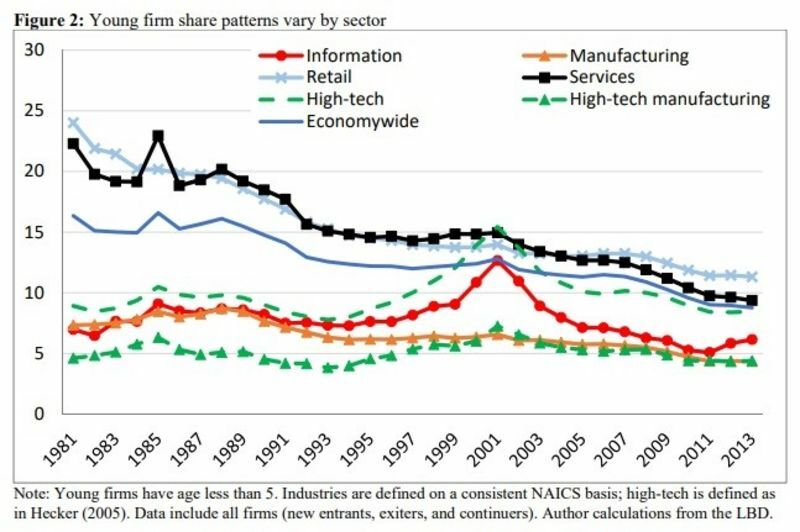 More proof the USA is becoming less capitalistic as it becomes more oligarchical: America�s Startup Scene Is Looking Anemic: Fewer people are taking the entrepreneurial plunge. , by Noah Smith, June 7, 2018 [Bloomberg, via Naked Capitalism]. Graph from a recent paper by economists Ryan Decker, John Haltiwanger, Ron Jarmin and Javier Miranda, National Bureau of Economic Research.